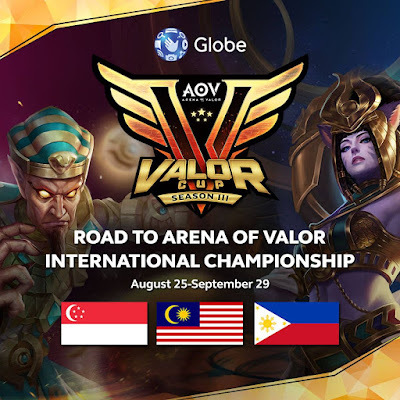 To all AoV gamers and fans, gear up for more thrilling gaming moments as Globe and Garena bring you Valor Cup Season 3: Road To Arena of Valor International Championship (AIC)! Since the announcement of the company's venture into Esports, Globe continues to cement its partnerships with the world's best Esports companies, bringing video gaming and Esports into homes, mobile devices, malls and competition venues. After the successful Globe Conquerors Manila 2018 tournament for League of Legends held last August, Globe now launches the AOV Valor Cup Season 3. The winning team will represent the country in not one but two international tournaments—Grand Finals: Road to AIC in Manila, and PVP Esports Championship in Singapore. At the PH National Finals this September 23 in Ayala Feliz Activity Center, the country's best Esports gamers will face each other in a battle that will test their skills and strategies. The winning team will not only advance to the Grand Finals: Road to AIC, but will also represent the country at the PVP Esports Championship. At the Grand Finals: Road to AIC, cheer on the Philippine team as they battle it out to be the best in the region! Drop by Ayala Malls Circuit on September 29 to support the country's representatives as they face off against teams from Singapore and Malaysia. The team who emerges victorious will advance to the Arena of Valor International Championship. Keep the Filipino pride going as the Philippine team heads to PVP Esports Championship in Singapore on October 5 to 7! Launched by Singtel Group, this multi-title league in Asia-Pacific features teams from India, Singapore, Indonesia, Thailand, Australia, and Philippines battling it out for the top spot. Join in on the fun and get your game on with Free 2GB for Arena of Valor when you register to GoSURF 50 and up! Now you can play AOV without worrying about consuming your GoSURF MBs or getting charged regular browsing rates. Globe Prepaid customers can also use this free 2GB data for other games such as Clash of Clans, and Clash Royale as well as for video streaming on YouTube, HOOQ, Netflix, Tribe, Cartoon Network, Disney, and NBA. For more information about Valor Cup Season 3, follow Globe on Facebook (https://www.facebook.com/globeph/) and Twitter (https://twitter.com/enjoyGLOBE/).